I found this sketch in the sketch builder i am trying to configure it to work with relay output but no luck. I know how to get a virtual pin to activate a digital output but in this example i failed. can anyone tell me how to do it here on V1 ? Time Input widget on V1. BLYNK_WRITE(Vx)  // Runs every-time switch widget is toggled. switchState = param.asInt();  // Get switch value. Because there is no pin named Vx. I’m assuming you just copy pasted that code from your sketch. @Ze_Pico you will need to locate an Arduino sunrise / sunset library or API for Blynk Webhook to actually control anything at sunset / sunrise. TimeInput widget simply checks if you have selected the option in the app, no more, no less. Was sunrise / sunset selected in the app? If yes, is it sunrise / sunset time now (from library / API) then take some action. I need you to try the sketch and tell me if you get it working with an output. TimeInput widget simply checks if you have selected the option in the app, no more, no less. @Costas that’s the expected output from V1. Just add “control” now. Try Timer Widget for this instead and manually set the time in the app. Ie stop and stop time. Start at around sunset at 8pm and finish around sunrise at 6am. The Timer Widget simply sends a 1 or 0 depending if it is active or not. if you can help me with the control it will be great. Timer Widget is the easiest way but you need to change the start and stop time every now and then. for the time being i am using IFTTT sending sunrise and sunset time from a WEMO switch to my hardware. You mean sunrise / sunset control or control generally? sunrise / sunset control using Time Input widget on V1. 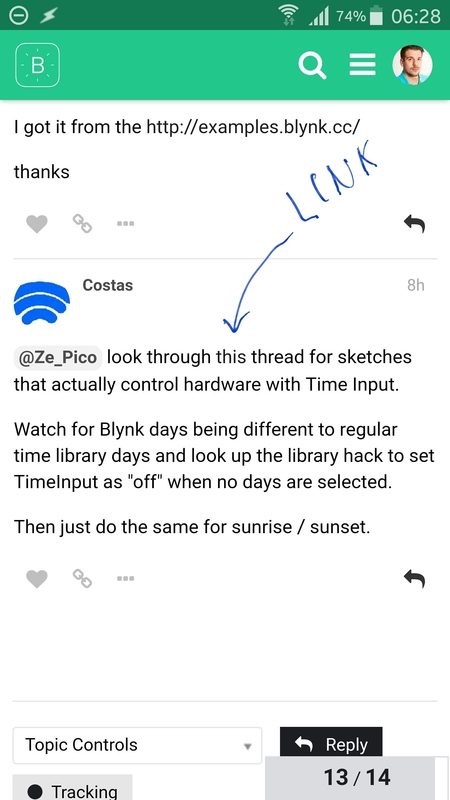 @Ze_Pico look through this thread for sketches that actually control hardware with Time Input. 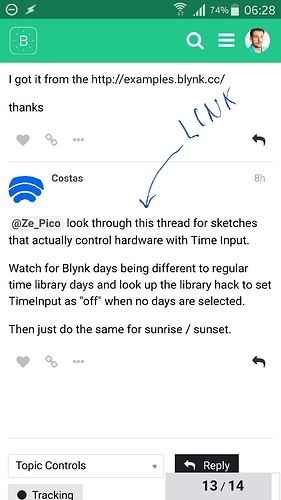 Watch for Blynk days being different to regular time library days and look up the library hack to set TimeInput as “off” when no days are selected. Then just do the same for sunrise / sunset. I think I will go back to posting links in full like this Timezone conversion for the Time Input widget rather than invisible links like this. The links are still not hightlighted in Chrome or on Smartphones but at least when Blynkers see the http://… it gives a strong indication that there is something to click on. Nice to see the SKETCH BUILDER link at the top of each forum page.